Learning how to balance academic pursuits and activities while in high school pays dividends in college and career. Jackson Academy seniors who have been recognized by the National Merit Scholarship Program illustrate that taking personal responsibility and challenging oneself, as well as having the support of teachers and family, are factors that help them strike a healthy balance. 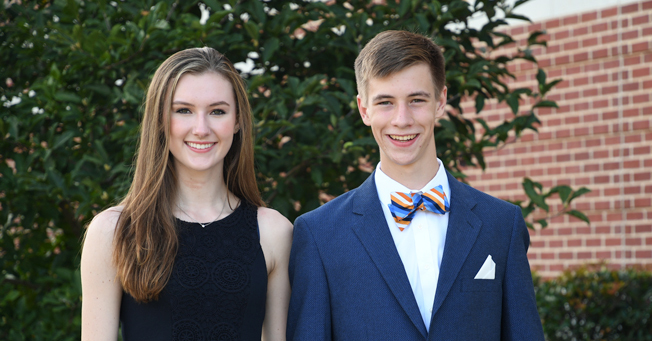 Alexander Schott and Nancy Usey have been named semifinalists by the National Merit program. They are among more than a million students who took the Preliminary SAT/National Merit Scholarship Qualifying Test last year as juniors. Those receiving semifinalist status make up less than one percent of high school seniors across the country. In addition to testing, students seeking finalist status must validate other qualities of excellence, involvement, and leadership through a detailed application process. Jackson Academy’s students took a moment to reflect on their favorite class, their future plans, choosing challenging courses, and their advice to other students. How has JA helped prepare you for academic success? The hands-on attitude of the teachers at Jackson Academy has definitely had the most impact in helping to prepare me for academic success. Each teacher takes the time to grow your talents in the classroom while simultaneously strengthening you in your areas of weakness. What classes are you taking this year? This year I am taking AP Government, AP Literature, AP Calculus, Civil War, and Intro to Engineering. Why do you like the challenge presented by a rigorous class? Rigorous classes keep you on the top of your game. It’s very easy to fall into a lazy pattern of just skirting by, but AP classes constantly challenge you and push you to be the best you can be academically. You also benefit from the intelligence of your classmates, which creates a healthy competitive atmosphere. What are your college plans, if you know at this point? I plan to attend Mississippi State University next fall. What things do you do outside of class? Outside of class, I spend my time playing on our school’s volleyball team and participating in Encore, Jackson Academy’s high school show choir. Which has been your favorite class, and why? I love both of the history classes I have taken with Mrs. Ball. She is witty and an excellent teacher. History is interesting because it’s just a big, complicated story. How has your family supported your academic success? My momma used to tell me to do my homework before I went outside to play ball. Now my parents mostly look out for me and make sure that I am challenging myself and staying on top of my work. I have always looked up to my sister as a smart and talented individual and tried to live up to her example. What do you hope to do in life? I’m looking pretty seriously at software engineering. I like big projects, and I really enjoyed the programming class I took in tenth grade. What things do you do outside of class, and which is your favorite? Last year I was involved in the Teen Trendsetters mentoring program, quiz bowl, a couple of math teams, marching band, show choir band, and Lions Band. I love playing in the Belhaven Orchestra. We make lots of pretty sounds, and no one gives me a look for being too loud. What is the best advice you could give to JA students who are coming up after you? I would encourage students to take advanced classes. I think anyone can find a class where they can push themselves and be successful, but first you have to take a chance and put in the effort. Any final words of wisdom as a JA senior?